The charitable organization My Friend’s Place, which helps homeless youths transition into self-sufficiency, received $2.2 million in donations in all of 2018. 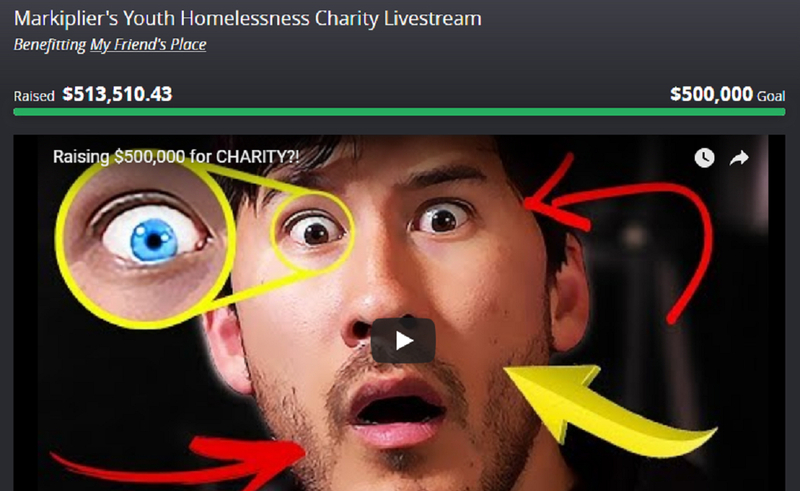 This past weekend, in less than 24 hours, famously generous YouTuber Markiplier raised a whopping one-quarter of that in a livestream to benefit the charity. Markiplier, whose real name is Mark Fischbach, kicked off the weekend-long livestream on Feb. 23 on fundraising platform Tiltify. He hosted the first 24 hours into Sunday morning, and successfully rallied his following of 23 million YouTube subscribers to raise his goal of $500,000. THE MARATHON CHARITY STREAM IS OVER!! Thank you everyone who stopped by, we ended up raising $500,000 in 24 hours! HUGE thanks to everyone who contributed and was a part of my slow descent into madness! Fischbach left the livestream after 24 hours (presumably to take a nap), but kept it running all weekend by passing it on to hosts like friend and fellow YouTuber Jacksepticeye. Jacksepticeye (aka Seán McLoughlin) is also known for his charity livestreams and sizeable contributions — last year, he raised more than $1 million total. This is the biggest charity livestream Fischbach has ever run in terms of amount raised. But, if all goes according to plan, Fischbach will raise millions more this year, thanks to his recent decision to donate every single penny of revenue from his merch to various charities. Based on his past earnings, that could add up to between $100,000 and $300,000 each month. Fischbach will continue to run monthly charity streams throughout 2019, spotlighting different organizations.